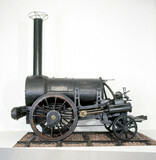 Remains of Stephenson's 'Rocket', 1829. 'Elevations of the Rocket', July 1829. 'The New Golden Arrow Pullman', SR poster, 1929. 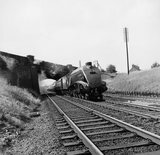 'The Record Breaking Run of Mallard', 1938. LNER 4-6-2 Class A4 No 4468 Mallard. Duches of Hamilton' 4-6-2 Clas 8P steam locomotive and tender, 1938.